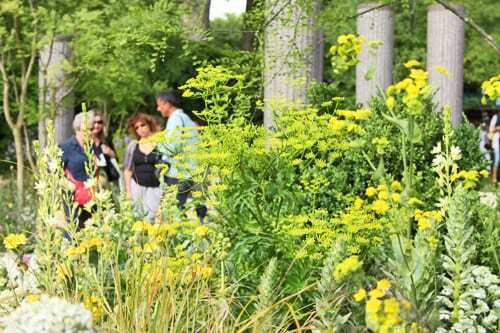 On Wednesday, I went to the 89th RHS Chelsea Flower Show in London…and what a wonderful day out it was! I’ll be sharing my time there with you, starting off today with the Show Gardens. 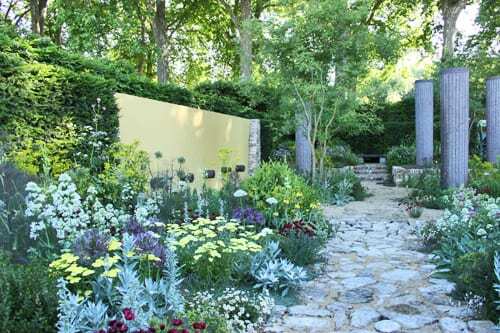 At Chelsea this year, there were seventeen Show Gardens and I’ve selected seven of them to show you. The first one is The Daily Telegraph’s sunken garden designed by Hampton Wick based designer, Cleve West. I’m not surprised at all that Cleve won a gold medal and ‘Best in Show’. I loved the beautiful colour scheme of reds, purples and yellows. Below are a couple more photos of Cleve’s design, with the second one showing him with some guests. 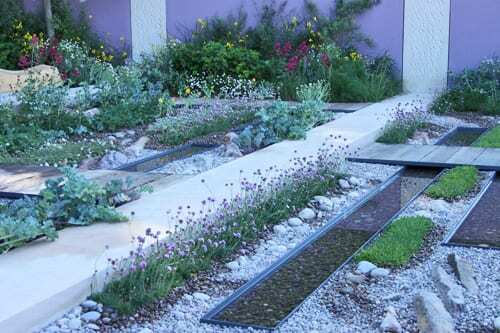 I also loved The Cancer Research UK Garden, designed by Robert Myers, with its coastal feel and colourful planting. 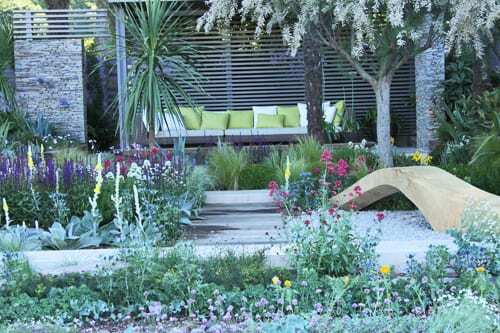 This garden won a silver-gilt medal…Doesn’t the seating look just so welcoming?! 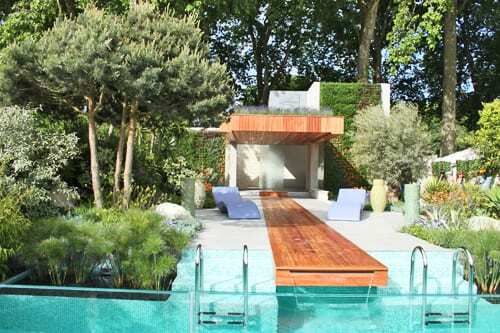 The next garden which caught my eye was another gold medal winner, A Monaco Garden, designed by Sarah Eberle – a very glamorous and contemporary roof top garden. 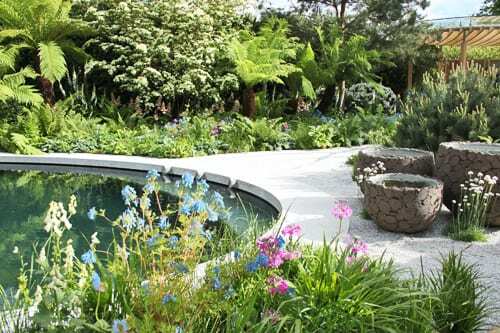 I loved the combination of the turquoise pool and the Geum ‘Totally Tangerine’ flowers. 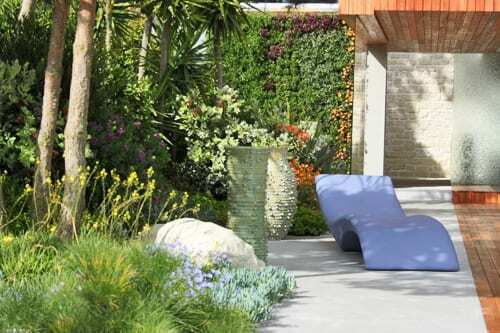 One of the most talked about Show Gardens was the Irish Sky Garden, designed by Diarmuid Gavin, which also won a gold medal. I know that the media have spent a lot of time talking about Diarmuid’s Wonkavator (yes…it’s actually called that!) and it was going up and down all day, however for me, it was the other end of his garden which I loved…it was a green tranquil oasis. 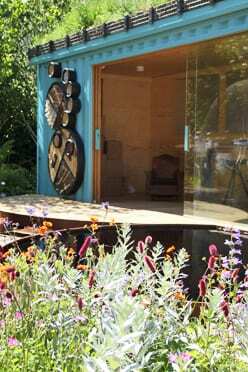 I adored the planting and unusual pots in Tom Hoblyn’s garden, The Homesbase Cornish Memories Garden, which won a silver-gilt medal. It was inspired by Tom’s childhood memories of family holidays in Cornwall. 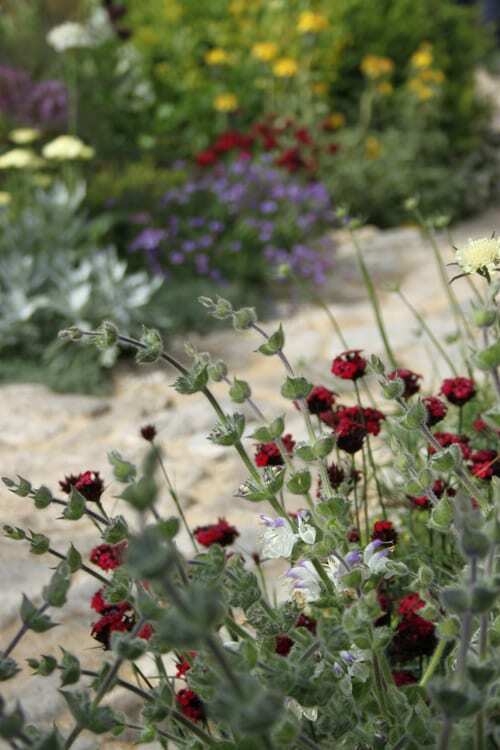 Also winning a silver-gilt was Nigel Dunnett’s garden, the RBC New Wild Garden, which was inspired by the planting ideas of Victorian horticulturist William Robinson. I loved the striking colour of the garden studio and orange Geum ‘Princess Juliana’ flowers. 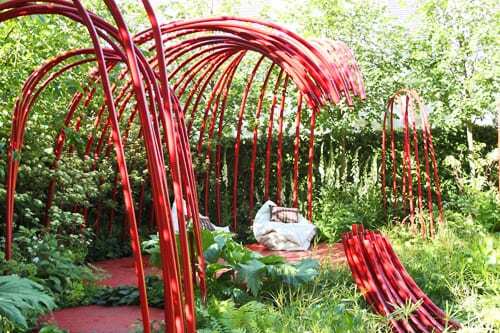 The British Heart Foundation Garden designed by Ann-Marie Powell was a garden of purely green and red, and won a silver medal. 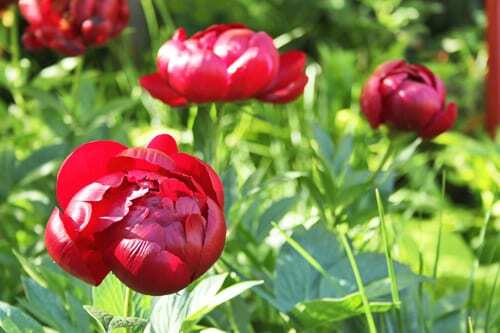 Admittedly, there weren’t many flowers in her garden, but the ones which were, were stunning! So, that’s my personal highlights of the Show Gardens. The colours this year of purple, orange and yellow seemed very popular and the buzz word I kept on hearing again and again, was ‘zingy’, describing colour…especially green! 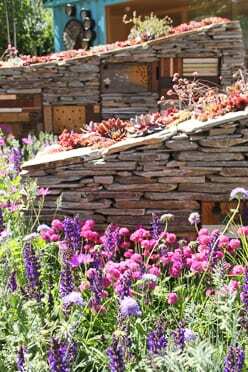 The Chelsea Flower Show is seen as the haute couture of gardening in the UK, yet just like designer fashion, this show is where trends start and soon filter down to our gardens. I hope you’ve enjoyed today’s post. 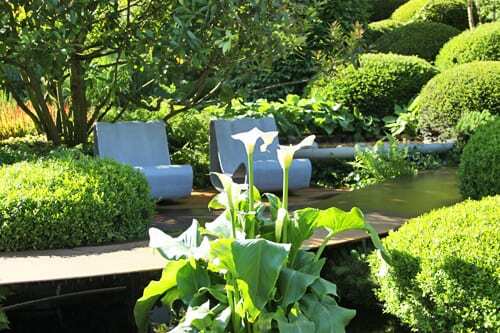 I don’t normally blog at the weekend, but as it’s Chelsea Week, I’ve made an exception… So, please do tune in tomorrow for highlights of the Artisan and Urban Gardens. And then on Sunday, I’ll feature lots of floral images from the Great Pavilion. The floristry demonstrations by Simon Lycett, Mathew Dickinson and Rebel Rebel will follow next week.